Posted on May 22, 2007 April 23, 2008 by Debito Arudou Ph.D. The Education, Science and Technology Ministry has produced guidebooks for language teaching, but most public primary, middle and high school teachers have little experience in teaching Japanese as a second language. Experts have pointed out the need for teachers who specialize in teaching Japanese to foreign children. In Oizumimachi, Gunma Prefecture, about 6,800 of the town’s 42,000 residents are foreigners, and about 10 percent of all students in the seven public primary and middle schools hail from overseas. Apart from regular classes, the schools also offer Japanese classes to increase foreign students’ language abilities. But the classes are taught by regular teachers who are not trained in language teaching. At Okubo Primary School in Shinjuku Ward, Tokyo, more than half the 180 students come from South Korea, China, the Philippines and other countries. “Even if these students can speak Japanese in everyday situations, acquiring the fluency that enables them to study in Japanese takes more time,” Principal Fumiko Nagaoka said. However, the children of such people often stop attending school due to language difficulties, or find it hard to secure jobs after graduating from school. The ministry has produced manuals for teachers to help them provide language lessons in conjunction with other subjects. A version of the manual was introduced for primary schools in 2003, and for middle schools in March this year. The manual for middle school teachers says that setting riddles and playing other word games during Japanese classes can help foreign students increase their vocabulary, and that creating a dictionary of unknown words for students also can be helpful. 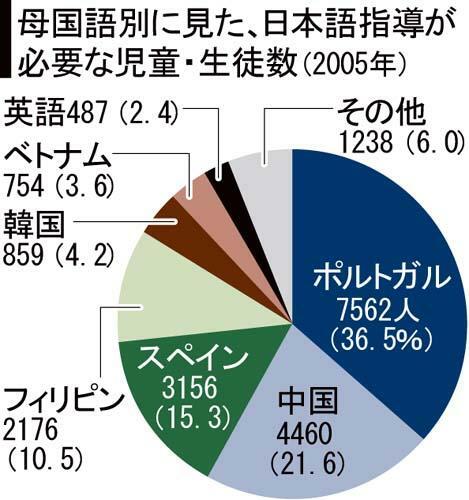 Only 70 of the 885 municipalities have specialized Japanese teachers. The ministry plans to expand the teacher-training system to cover Japanese-language instruction.